For this week’s photo challenge, Humanity, I choose to highlight one of the most delightful experiences where all kinds of people come together for a common pursuit…the weekly market. Being in small town, southern France at the moment, markets are all around us, the closest being in the town of Ganges, in the Hérault Valley, north of Montpellier. Every Friday, hawking food and everything else you can imagine, there are artisanal bakers, butchers, fish mongers, cheese makers, olive producers, fruit and vegetable farmers, alongside people selling skirts, tops, sneakers, leather handbags, records and CD’s, incense, pottery, flowers and even one stall selling mattresses (HOW do you get that in/on your car?) and did I mention the live chickens, pigeons and rabbits?! They are there week after week, sometimes making a sale that doesn’t even equal a Euro, and always with a very pleasant, “merci, bonne journée’. Even if my pantry is full, I go to the weekly market…it is a grand celebration of life and humanity. Commence the tour…the other way out! The house we are renting comes with 2 bicycles, at our request. It seemed like a lovely idea at the time…the French countryside, endless vineyards and olive trees, dry, sunny days that went on forever, and we two cycling leisurely, baguette and wine in our side bags. 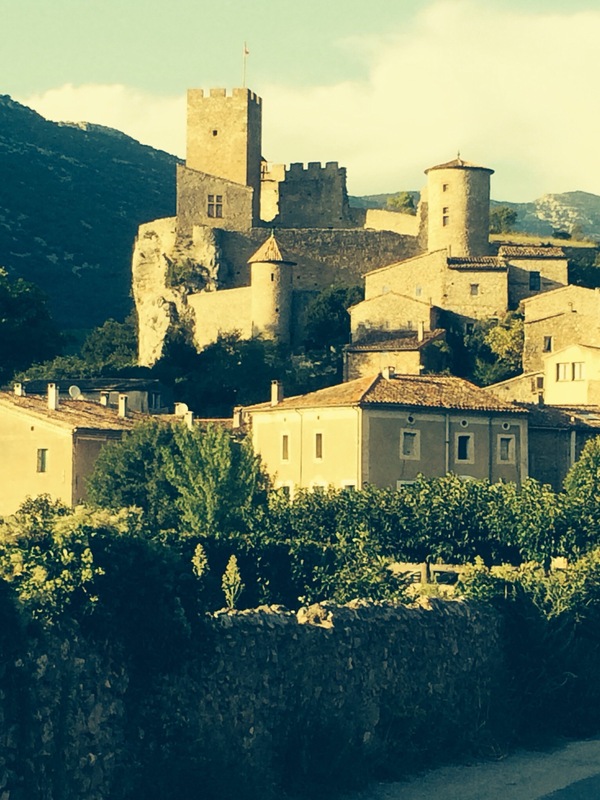 There is a very small village in the Languedoc Rousillon region of France that is now our home for a month. Simply by putting our suitcases into our house we raised the local population from 109 to 111 for the month of September. Yes, very small village. This is a necessary slowing down, a putting on the brakes that can only be done when everyone around you is doing the same…when the lifestyle dictates the road speed. It’s noon…go home and eat lunch…you may as well lie down a bit, too, because nothing opens again until 2:00. Yes, the lifestyle posts the road signs…and we plan to obey every rule!